The first resorts in America were modeled after the popular English health spas at Bath, Buxton, Scarborough, and other locations renowned for healthful waters. Elite society traveled to mineral springs in search of "a cure" and, by the late eighteenth century, such resorts had become social meeting places as much as retreats for the invalid. American destinationsNewport, Rhode Island, Bristol, Pennsylvania, and Saratoga Springs, New Yorkadvertised the benefits of mineral water and temperate climate while providing activities for heathy vacationers. Coastal resorts gained in popularity at the turn of the nineteenth century, when improved steamboat, sloop, and stagecoach connections enabled a wider class of people to travel from the city to seashore. 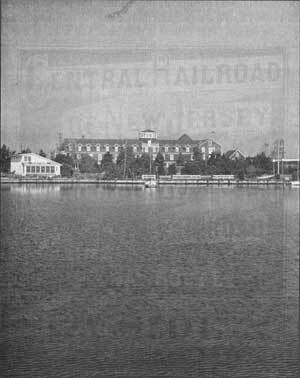 Guidebooks advised that the Jersey Shore was part of a well-established resort industry, by the end of the Civil War. In 1868, vacation planners could consult The Book of the Summer Resorts to determine which destinations corresponded with their desires and budgets. First-time vacationers might choose Long Branch, Saratoga, or the White Mountains, "the three great summer resorts of the country." Guests of the best hotels at Niagara, Long Branch, (Fig. 1) Newport, or Cape May could expect to spend $50 per week. Figure 1. "The Beach at Long Branch." Appleton's Journal. 1869. When it was initially advertised in 1824, marketers of Coney Island, New York, promoted sea bathing as a tonic after a hard day's work, but the railroad soon brought a different class of excursionists lured by more exciting promises. On the Jersey Shore, Atlantic City was the first of several resort cities created in anticipation of the crowds of middle class vacationers who would arrive by railroad. During the last decades of the nineteenth century, railroad companies began to publish their own promotional descriptions and illustrations, including train schedules and information on accommodations. 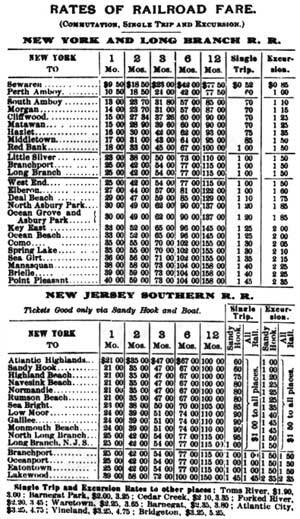 Gustav Kobbe's The Jersey Coast and Pines (1889) printed New York and Long Branch Railroad schedules, (Fig. 2) and William Balch's Cape May to Atlantic City (1883) was published by the passenger department of the Pennsylvania Railroad Company. In the margins of his "summer notebook," Balch provides railroad routes, trolley car exchange points, and ticket prices. Figure 2. Rates of Railroad Fare. The Jersey Coast and Pines. 1889. The rise of automobile transportation changed patterns of tourist travel, affecting the economic, and therefore, the physical condition of once-popular resorts. Governor Alfred E. Driscoll in his Fifth Annual Message to the Legislature on January 8, 1952, declared: "There is an urgent need for additional parkways, freeways, and turnpikes to carry the commerce of our State and nation, to permit our citizens to travel more easily back and forth between their homes and businesses, for recreation and, equally important, to achieve greater highway safety ... I recommend that there be created within the State Highway Department, as an integral part thereof, an Authority to finish the Garden State Parkway [as it was called by then] promptly as a revenue-financed facility." Rather than spend the entire season at the shore, motorists preferred to tour the coast on shorter trips or enjoy a day by the sea. As the tradition of summering declined, many of the seasidee activitiessea bathing, carriage races acrss the beach, and trolley ridesalso became old-fashioned. In an effort to survive, Jersey Shore resorts have attempted to draw year-round populations by building such all-weather attractions as casinos, convention centers, and retirement communities. While some cities, such as Cape May, capitalize on their Victorian heritage, all have been forced to concede to the demands of the automobile. 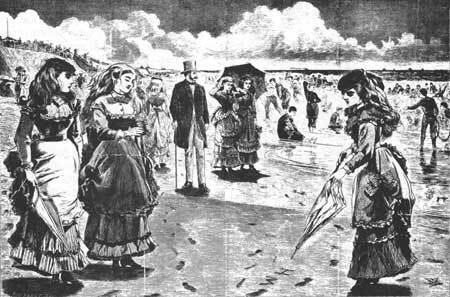 Cape May and Long Branch may claim precedence as the "first Jersey shore resort," but nineteenth-century historians considered Tucker's Beach (Fig. 3) the earliest resort in the area. According to Woolman and Rose, publishers of an 1878 atlas, "it is supposed that Reuben Tucker's house on Short Beach was the very first and oldest house on the coast of New Jersey that was opened for the entertainment of health and pleasure seekers." 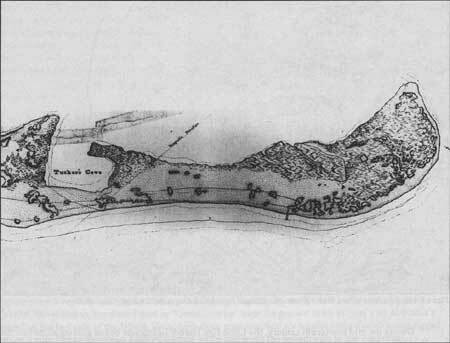 Tucker acquired the property at the southernmost part of Long Beach, known as Short Beach, sometime between 1725 and 1765. His popular boardinghouse for sportsmen was described as "a one-story house with a hipped roof and front piazza, standing 500' from the shore" and "elevated on a heap of sand and shells." Fishermen and game-bird hunters from Philadelphia took stagecoaches to Tuckerton and then sailed to the beach. After his death, Tucker's wife supervised the business, which continued to operate as "Mammy Tucker's Inn." Figure 3. Detail Map of Tuckers Island. Records of the Office of the Chief of Engineers, Library of Congress, 1839. Figure 4. Map of Tuckers and Long Branch Islands. Historical and Biographical Atlas of the New Jersey Coast. 1878. Figure 5. Tuckerton Mill Site. West Main Street and Water Street, HABS No. NJ-1030-2. During the mid nineteenth century, the Little Egg Harbor lighthouse began guiding ships into the bay. By 1866, a lifesaving station was also constructed. As the area's popularity spread, more houses were built along the Little Egg Harbor shore to supply the growing number of sportsmen with food and entertainment. The island itself supported two hotels (the Columbian and the St. Albans), several cottages, and a schoolhouse. To attract potential tourists, promoters of the beach briefly experimented with more alluring names such as St. Albans-by-the-Sea and Sea Haven. Beginning in 1917, the island was buffeted by a series of damaging storms. A new inlet created by a 1920 gale eroded the shore and threatened homes. Over the next seven years, occupants of the island were forced to evacuate; only the lightkeeper and his family remained to witness the island's gradual submersion. The "first Jersey shore resort" disappeared completely under the ocean in 1938. 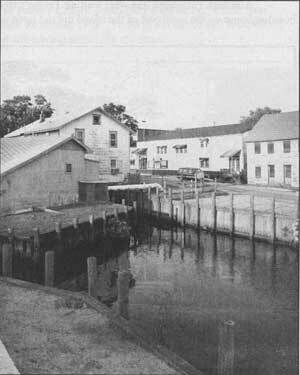 Today, the town of Tuckerton (Fig. 5) attracts tourists seeking antiques, but retains little of its resort past and only the memory of an island beach that once drew nineteenth-century visitors from their urban neighborhoods. In his account of the Jersey Shore's early history, Philadelphia annalist John Fanning Watson considers Long and Tucker's beaches the earliest coastal destinations. Figure 6. Harvey Cedars, Long Beach, below Barnegat Light, Harper's Monthly, February 1878. 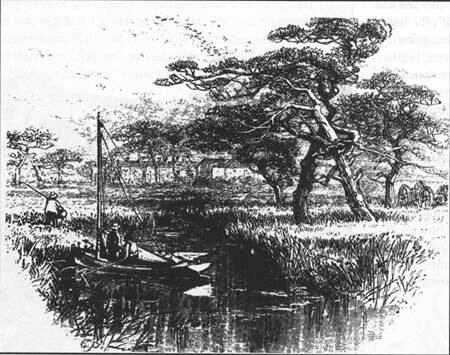 Inspired by Horner's successful enterprise, a group of Burlington County farmers formed the Great Swamp Long Beach Company and built a similar hotel at Great Swamp, now Surf City, between Barnegat and Central avenues. The Mansion of Health, completed in 1822 and later nicknamed "Buzby's Place," was "furnished in the best manner for the convenience and comfort of visitors, and the natural advantages over any other on the sea coast" were numerous. An account written the following year describes it as a "large house 120' long, and about one-tenth of a mile from the sea, well kept, and supported by a goodly number of inmates." Despite the resort's instant popularity as a rugged, healthful location, the building was in poor condition within thirty years. In 1847, Capt. Sammy Perrine opened a competing hotel, the Harvey Cedars. Within a few years, Harvey Cedars was vying for business with two other sizable boarding hotels on the islandthe Mansion of Health and Bond's Long Beach House (previously the Philadelphia Company House). Wealthy men savored the frontier experience of these hotels, enjoying the luxuries of fresh seafood, waterfowl, and liquor, while sportgunning and courting the rugged life. 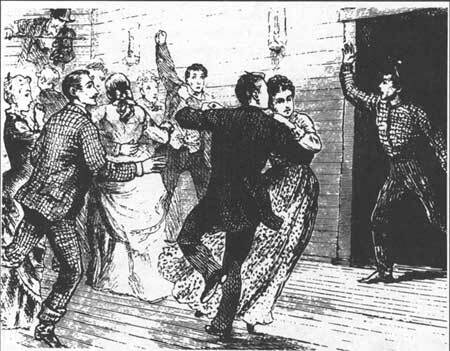 The public dance hall on the south side of the hotel contributed to Harvey Cedars' continuing popularity. "Uncle Sam" Perrine, a well-known fiddler, supplied the music for dances (Fig. 7) held in the dance hall south of the hotel. Perrine was later the captain of the first life-saving station on the shore. Figure 7. A Ship Ashore!" Harper's Monthly. February, 1878. When Capt. Isaac Jennings purchased Harvey Cedars in the mid 1880s, he and his wife improved services to compete with the more refined hotels springing up on Long Beach Island. But, the Harvey Cedars Hotel was always a little different. Mrs. Jenning's brother, David White, decorated the grounds with beach wreckage so it resembled a maritime junkyard. After Jennings' death, Billy Thompson, "Duke of Gloucester," expanded the building and added an elaborate pressed-tin dining room. With its more sophisticated external appearance, the hotel hoped to compete for the recreational trade Thompson expected would reach Long Beach by railroad. The development of the Beach Haven area proved to be too much for Harvey Cedars, however, and the newly renovated hotel closed in 1903. At the bankruptcy sale in 1912, the hotel's losses included: "all personal property belonging to Harvey Cedars Beach Company including furniture, carpets, rugs, silverware of every kind and description now in the Hotel or on the premises excepting glassware, chinaware, table linens and bed linens and except the stock of wines and liquors." The building has been occupied by the Harvey Cedars Bible Conference (Fig. 8) since 1941. Figure 8. Harvey Cedars Bible Conference, Long Beach Island. HABS No. NJ-1143-1. Before the establishment of life-saving stations in the 1870s, early hotels like Harvey Cedars often functioned as temporary shelters for shipwreck victims. Capt. Thomas Bond maintained a government house of refuge on his Long Beach House property. Another house of refuge built at Harvey Cedars was later moved down the bay to Beach Haven and remodeled as the Hotel DeCrab. In the 1870s, the houses of refuge were replaced by six life-saving stations, each equipped with trained crews and Francis Life Cars. 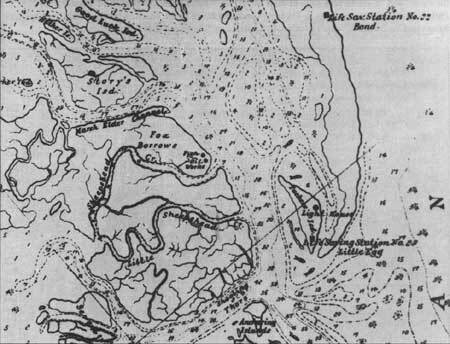 The crews and their families settled near the improved stations located at Barnegat City, Loveladies, Harvey Cedars, Ship Bottom, the Terrace, and Holgate, two miles south of the Tucker's Island station. In 1915, the federal government combined the Life Saving Service and the Revenue Cutter Service to form the U.S. Coast Guard. Before the Life Saving Service established its assistance network along the shore, Barnegat Lighthouse guided ships navigating the Atlantic waters. The original lighthouse of 1836 was replaced by the present structure in 1858. Lieutenant George Meade's contemporary report on the light's condition stressed that "it forms, in connection with Fire Island Light, on the other side, the true mouth to the great commercial harbor of New York." The 1858 concrete-washed brick tower stands more than 180' high and is equipped with a lens made of 1,024 prisms. Although the light's duties have been assumed by a lightship moored in the bay, the lighthouse continues to serve a symbolic function, now as part of Barnegat Lighthouse State Park.